The 2.12.0 update is finally available in the App Store. This update features a new widget on iOS - Video Streaming. Widget supports RTSP, RTMP and HLS (HTTP Live Streaming) real-time streaming formats. You can set the url in widget settings or dynamically via setProperty() function. Also in this build we’ve added settings to control axes visibility in SuperChart. Best video camera for Blynk use? @Eugene so iOS is just missing the following, to bring it up to Android “standards”, right? which will generate a URL for the camera that embeds the username and password and forces the H246 stream. Popped that in the widget and it works fine. Any plans to allow switching to full screen rotated view, as with the SuperChart? @sh.abar.mard already fixed will be deployed soon. Thanks for reporting. Yes. Plans. No eta for now. Or as a idea please do it esier maby save last qr code on app and set a password for that to sign in it is better than scan with camera eachtime. I habe some problem with this method eachtime it should be re scan with camera and it is so borring. I’m confused by this. I thought that there was a limit of 4 tabs, but from @sh.abar.mard’s screenshot that’s clearly not the case. I tried adding extra tabs to my existing 4 tab setup and it didn’t work. I checked the in-app help information and it says “you can have as many tabs as you need”. I tried adding another project with a tab and once again I can only go up to 4 tabs. 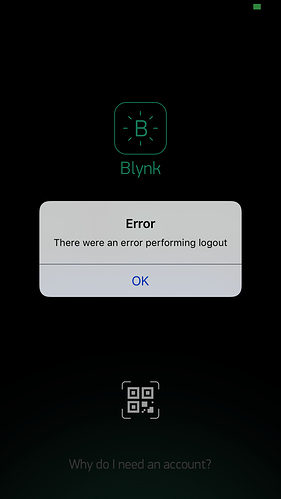 I’m using the Blynk cloud server, so maybe this is the issue? If so then the in-app help info needs updating. Also, I realised that there’s no way to delete a tab once it’s bedn added. You can delete the whole tabs widget, but not an individual tab. Maybe this needs a bit of work - probably with a check to stop you deleting a tab if it has widgets on it? this is share project on a android device. We’ll fix that info popup. Also, I realised that there’s no way to delete a tab once it’s bedn added. Only the last tab can be removed. To remove a tab, swipe left on the tab name in Tabs Settings screen. Yes, this is a temporally limitation when opening numerous tabs created on Android. We’re already working on a new Tabs widget, on both iOS and Android, which will have a new look and work seamlessly on both platforms. It should be released soon. Yes, this is a part of an upcoming Tabs widget update I mentioned above. More Than 4 Tabs, or Maybe a Different Way? i does not push any notification when i use share project on Iphone but on Android i receive notify. I observed, that this version has problem with notification when iPhone is locked. I am receiving notification only after unlock my phone iOS 10.3.1. Notifications are working fine on the devices we test. Check that you have a “high” priority set for notification in widget settings. After removed notification widget and put it once again to project, it works correct. I try but it doesn"t work on iphone that is using shared project. I use shared project on iphone and any dosn"t push and i try to remove and install new widget but it doesn"t work.